The American Center campus master plan | Vandewalle & Associates, Inc.
American Family Insurance Headquarters: Madison, Wisconsin. Vandewalle & Associates worked as land use planners and development advisors on a land use plan for an 800-acre site acquired by American Family Insurance Group on the east edge of the City of Madison, Wisconsin. The site is bordered by Interstate 90-94 and U.S. Highway 151. The goal of this project was to select a site for a new national headquarters facility for American Family Insurance. The land use plan reserved a 400-acre parcel for development of Phase I of the national headquarters; including 500,000 square feet for an office building, a data center, and a training center. The balance of the site was planned as a mixed use business center named the American Center. 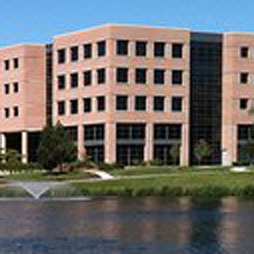 The American Center includes a 250-acre corporate office park, a 50-acre commercial service complex, and a 100-acre support core. In addition, Vandewalle & Associates worked closely with American Family, the State of Wisconsin, and local public agencies in ongoing implementation efforts for the project. This included the relocation of the urban service area to serve the national headquarters site, annexation of the property to the City of Madison, and the development of plans for traffic circulation including the construction of an interchange on U.S. Highway 151. The American Center is now developed and is a centerpiece for economic development in South Central Wisconsin.